Arlington’s School Board is set to pick a new name for Washington-Lee High School next week, putting an end to the simmering debate over how to best strip Robert E. Lee’s name from the building. The Board voted in June to remove the Confederate general’s name from the school’s moniker, kicking off months of squabbling over potential new names and even a failed lawsuit seeking to block the change. A renaming committee has recommended “Washington-Loving” to honor the Virginia couple who successfully challenged the state’s ban on interracial marriage, while “Washington-Liberty” earned the support of some committee members as a secondary recommendation. Others still supported swapping in one Lee for another, particularly William Lee, George Washington’s enslaved manservant. The following letter to the editor comes from a coalition of W-L alumni, former faculty members and even one of the original four black students to integrate the school in support of that option. The letter writers argue that the Board should delay its vote on Thursday (Jan. 10), and pursue a more “unifying solution” than its current options. We are alumni and community stakeholders who care deeply about Arlington and the legacy of its oldest high school, Washington-Lee High School. We also support one of the renaming committee’s five finalist names, Washington-Lee High School, in honor of the African American Revolutionary War patriot William Lee. A school that figures so prominently in Arlington’s history deserves a name that will inspire an understanding of our nation’s complex past and how it can move us forward. The clumsy attempts to retain the school’s nickname with the current Washington-Loving and Washington-Liberty proposals, however well-intentioned, do not meet that high standard. The name William Lee best “aligns with or reflects the APS mission, vision, and core values and beliefs” as stated in Policy F-6.1 Naming of Facilities. William Lee, who served alongside Washington throughout the Revolutionary War, has long represented the contributions of the country’s “neglected patriots,” enslaved African Americans who fought in the Revolutionary War for their country and their own personal freedom. These patriots and heroes will soon be honored by the National Liberty Memorial on the National Mall in Washington, D.C. Congress has approved a location for the memorial which, poetically, could be the last site on the Mall across from the Washington Monument. Their contributions, previously shunned, are among the most important in our nation’s history. Moreover, because of the intimate connection between the two men, Lee’s influence on Washington, his abhorrence of slavery, and our country’s founding are of profound importance. A newly renamed W-L could be a powerful impetus that redefines history and imbues our diverse community with a common purpose and pride. Unfortunately William Lee had not been properly considered by the committee due to historical inaccuracies in its brief biography of his life and an incomplete assessment of his legacy. Regarding Mildred Loving, there are serious questions over how she viewed her own black heritage. While it is laudable a member of the Arlington Historical Society was appointed to the committee, historians and other experts should have been consulted as history is often more complex than it appears on the surface. Moreover, the significant number of resignations from within the committee further cloud the process. As the legacy of a school and county hangs in the balance, it is critically apparent that the five finalist namesakes need to be more thoroughly researched. With a postponement of the Jan. 10 vote on a new name, the School Board could rectify these fundamental shortcomings. Moreover an extension would help build a bridge to alumni who have felt sidelined throughout the entire renaming process, which has lacked the transparency and public discourse typical of the Arlington Way. Hopefully, William Lee would then be fairly vetted by all stakeholders and the School Board. Alternatively, since Lee is one of the five finalist names chosen by the committee, the Board could opt to choose among all of those names on Jan. 10. Notably, many alumni who had been divided over the name change are now embracing the William Lee name as the school’s best opportunity to educate and inspire future generations of students. The process is an understandably difficult one, made more painful by missteps that could have been avoided. We feel without reservation that the name Washington-Lee High School in honor of William Lee would be the most unifying solution, and one that will likely ensure continued alumni support that has been invaluable over the past 90-plus years. 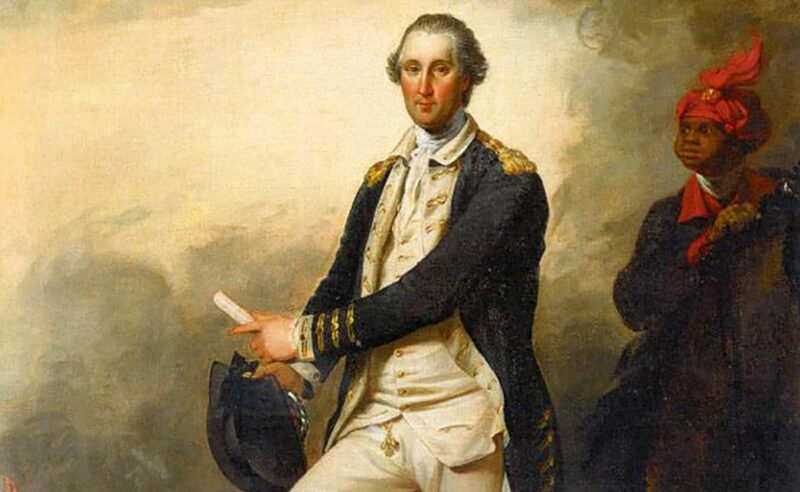 Most importantly, the school would have a dignified name and inspiring new namesake with an unmistakable connection to one of our country’s earliest African American heroes who helps us to better understand Washington and his extraordinary nature. We are a group of alumni, alumni faculty, and stakeholders. Many of us have contributed to local civic and cultural affairs over the years and devoted thousands of hours to support the excellent educational opportunities at Washington-Lee and APS. Our names are listed in no particular order. Bill Sharbaugh was the principal of Washington-Lee High School from 1976-1999. Maurice Barboza is CEO of the National Mall Liberty Fund, a non-profit that supports the establishment of a memorial to African American contributions to liberty during the Revolutionary War. Charles Augins is one of the four students who integrated Washington-Lee in September, 1959. The following Letter to the Editor was submitted by Mike Rosenberger, a parent of a second grader at Abingdon Elementary who has deep concerns about a proposal by Arlington Public Schools officials that would send some students in South Fairlington neighborhoods to Drew Model School instead of Abingdon. The School Board has spent the last few months considering a redrawing of boundaries for eight South Arlington elementary schools, precipitated by the opening of the new Alice West Fleet Elementary next year, and tempers have frequently flared over how the changes will impact Drew, in particular. But one APS proposal designed to alleviate those concerns has prompted new worries among Abingdon parents. The Board is still considering a variety of proposed maps, and will approve final boundaries in December. I am writing regarding the proposed elementary school boundary map released at APS’s “What We Heard” meeting on Oct. 17. APS’s proposal to bus the students of southern Fairlington from the walkable Abingdon school zone to Drew Model School is not in the best interests of the children and does not reflect the values or the limited transportation resources of the county. The failure of the “What We Heard Proposal” to address in a fair and appropriate way several of the county’s guiding principles in the redistricting process means that this map should be withdrawn from serious consideration. One of APS’s objectives in establishing new elementary school boundaries is to ensure that most students can attend the school closest to their home. 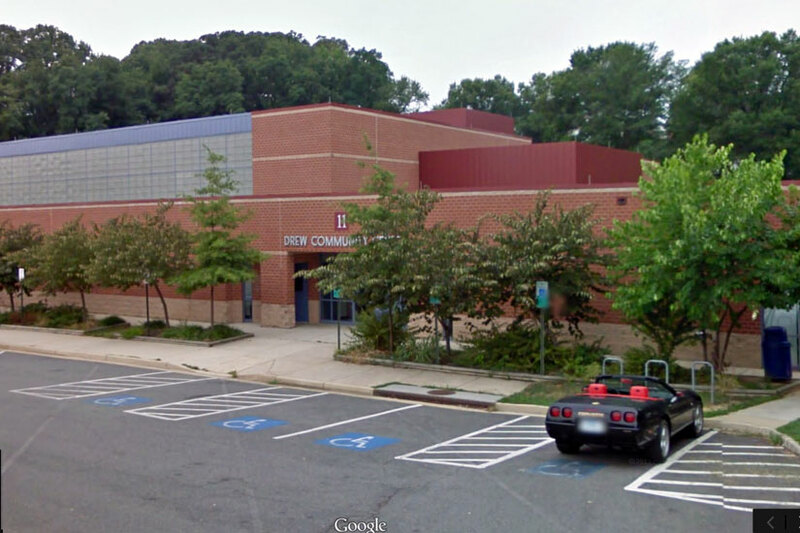 Under the current proposal the students of southern Fairlington, all of whom live within one mile of Abingdon, would be bussed up to two miles to Drew Model School. 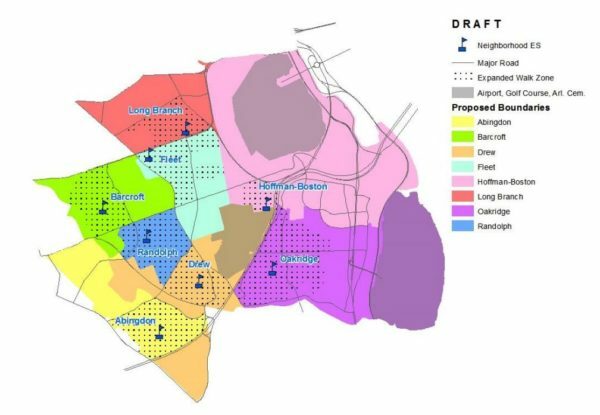 This proposal would effectively eliminate the popular options of walking and biking to school for all southern Fairlington students, despite the know health benefits of walking or biking to school. Virginia’s Safe Routes to School initiative recognizes that children who walk or bike to school are more active, more physically fit, and more ready to learn when they arrive at school than students who are driven or bussed to school. Increasing the school transportation needs of Fairlington also has important consequences for APS’s future capital and operating costs. The fiscal year 2019 school budget already allocates $18.3 million for transportation and was only balanced by extending the useful life of buses by three years. Arlington County is already being forced to make difficult financial decisions about existing tax rates and services. The School Board must look for opportunities to stabilize or reduce transportation costs and concentrate its budget on children’s educational needs. The walk from southern Fairlington to Abingdon is through a safe neighborhood that features contiguous sidewalks, crosses no major roads, has no traffic lights, and, for some children, would be as short as .3 miles. Expanding the Abingdon walk zone would be a common-sense decision that supports APS’s dedication to the welfare of the whole child and would seize a valuable opportunity to reduce transportation needs from the current levels. I ask the School Board to consider the significant benefits of leaving the southern portion of Fairlington within the borders of Abingdon Elementary School. I understand that redrawing school boundaries is a difficult process. Finding a better alternative to the current proposal would not only be in line with Arlington County’s efforts to promote walkable communities, but would also serve the health interests of the children of southern Fairlington and APS’s limited transportation resources and budget. I encourage APS to withdraw the “What We Heard Proposal,” to explore other options, and to think more creatively about possible solutions to the challenges we face as we work to ensure our schools meet the needs of our communities. ARLnow.com occasionally publishes thoughtful letters to the editor about issues of local interest. To submit a letter to the editor for consideration, please email it to [email protected]. Letters may be edited for content and brevity. Photo via Arlington Public Schools. After many long months of debate, county officials are set to have their say next month on an extensive proposal for the Virginia Hospital Center’s expansion. 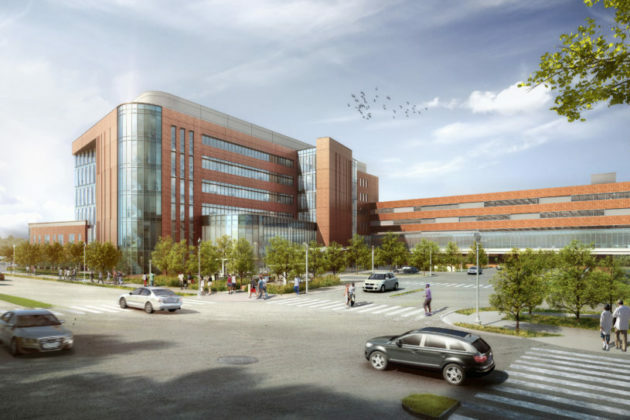 The project has attracted plenty of criticism from neighbors and transit advocates alike, prompting a brief delay of the county’s consideration of the 101-bed expansion of Arlington’s lone hospital. But the county’s business community recently threw its support behind a swift approval of the project, as has another longtime civic leader. Julian Fore, a former president of the Arlington Community Foundation, is also urging the County Board to lend the project a full approval in a letter he shared with ARLnow. I am an Arlingtonian and frequent user of Virginia Hospital Center (VHC). This first-rate hospital provides excellent acute care and places an emphasis on needed follow-up services and disease management. 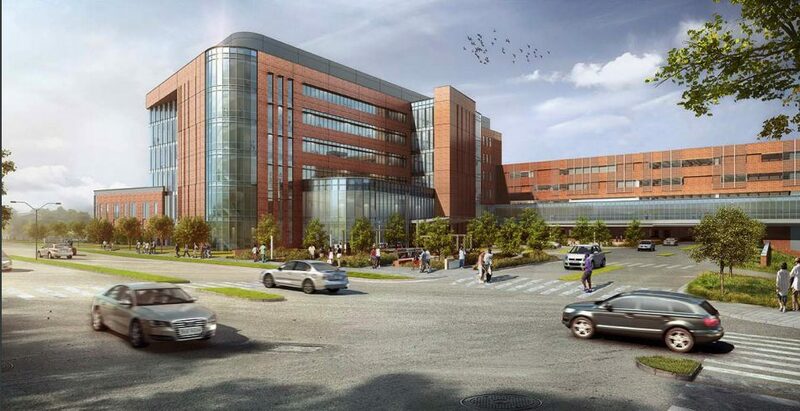 VHC is a community jewel and is deserving of our support for its expansion project. I urge the County Board to approve the VHC application. We should all be in favor of VHC’s desire to improve the efficiency, convenience and accessibility of healthcare. These are important community benefits and should be acknowledged. Moreover, the newly proposed Behavioral Health Center will enable our friends and neighbors who are suffering from mental illness to receive immediate outpatient care. The VHC proposal also expands the number of psychiatric beds based on a community-negotiated formula and subject to State approval. 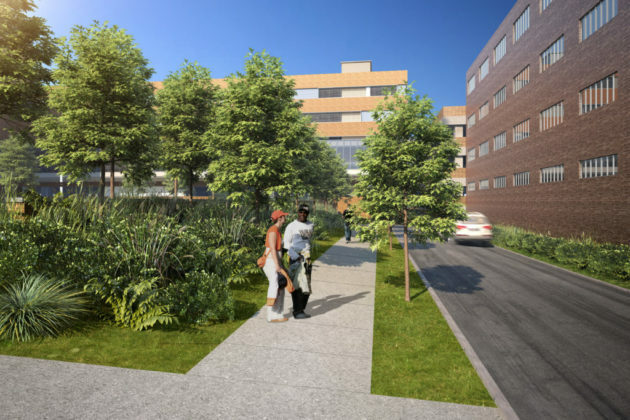 It is important to note that under the VHC proposal, 1.3 acres of the 5.5 acre Edison Street site are either landscaped or open space to bring visual relief and more greenery to the site. The placement of the landscaping and open space creates a “sense of place” and a welcome oasis to an urban village. This action demonstrates VHC’s commitment to enhancing the appearance and livability of the surrounding neighborhood. At this point, we need to acknowledge that the cumulative effect of additional requested changes to the VHC proposal will affect the broader community goal of increasing the availability of low-cost, high-quality, patient-centered healthcare. VHC is the only stand-alone community hospital in the greater Washington D.C. Metro area. It is in the public’s interest to enable VHC to contain development costs, so the Hospital has more dollars available for needed state-of-the-art equipment and other patient related services. 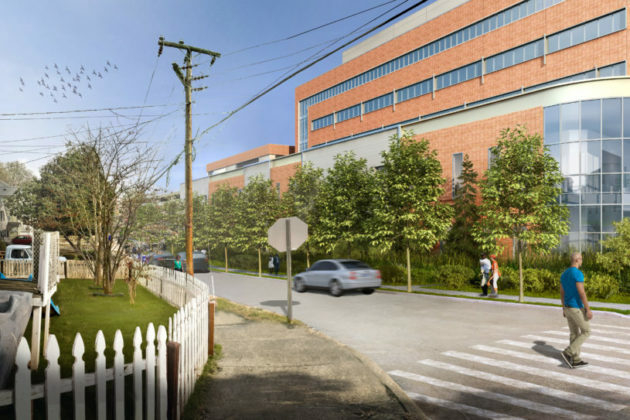 I hope the County Board recognizes that the overall public benefits provided by the VHC expansion are too important to be held hostage by the narrow concerns of nearby neighbors. ARLnow occasionally publishes thoughtful letters to the editor about issues of local interest. To submit a letter to the editor for consideration, please email it to [email protected] Letters may be edited for content and brevity. The following Letter to the Editor was submitted by Mac McCreery, David Peete, Tom Prewitt, Robin Stombler and Jeff Zeeman. McCreery, Peete, Prewitt and Zeeman are all members of the Arts District Committee. Stombler serves as Chair of the Committee. We didn’t always agree at first. As representatives of business, arts, industry, and community interests, we were bound to have divergent ideas, but we came together as members of the Arts District Committee, a component of the Four Mile Run Valley Initiative Working Group. Let us share with you what we found. Arlington already has a burgeoning arts district. Along South Four Mile Run Drive, between South Nelson Street and Walter Reed Drive, there is an 85-seat black box theater, studios for dance classes and recitals, gallery space, a costume and property shop for a Tony-award winning regional theater, and a private recording studio where the country’s most widely recognized and acclaimed bands lay down tracks. Over 30 arts-related organizations already call this area home, including multi-ethnic heritage arts groups. In this neighborhood, we also have the last vestiges of light industrial space in Arlington. It is a relatively affordable place for small businesses to operate, such as a new distribution brewery and multiple family owned mechanic shops that have operated through generations. We quickly determined that an arts district must embrace both the cultural arts and the industrial nature of the area. This melding of uses is important for sustainability and long-term economic viability. 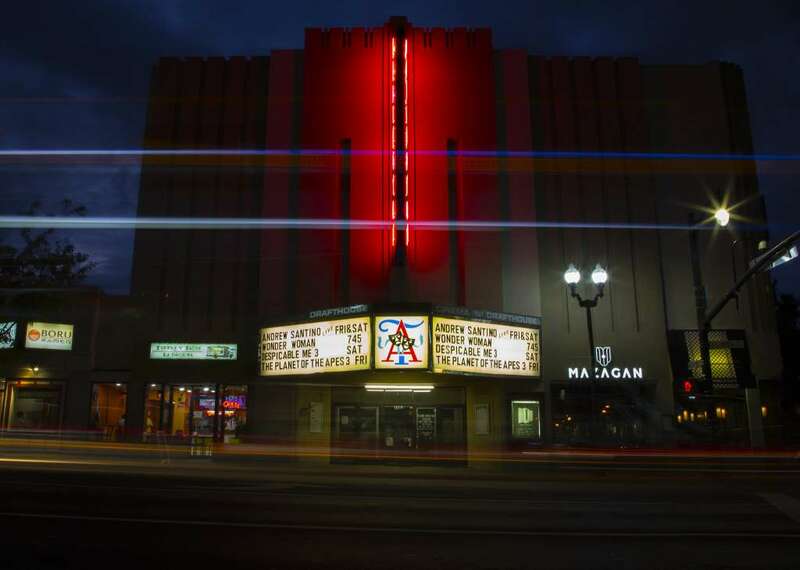 For a revitalized arts and industry quarter, we define arts broadly. Imagine theaters, rehearsal halls, visual art galleries and craft spaces. But also fuse the arts with light industry to include culinary arts, metalworking, furniture making shops, and technological innovation/maker spaces. These examples are meant not to limit, but rather to highlight some of the uses envisioned. Using one scenario, the Arlington Food Assistance Center could be combined with culinary arts classes and catering and a rooftop garden could support those endeavors. The quarter should espouse innovation, creativity, skill and talent. A sound infrastructure is necessary for this quarter to thrive. We researched and expounded on five elements: Mission, Physical, Financial, Development, and Arts Specific. Within these elements is a call to embrace the industrial roots of the area with a thriving mix of arts, culture, business and industry. We have the opportunity to expand on a unique area of Arlington, leverage existing institutions and buildings, and stop the cookie cutter development from settling in. While this area already provides value with its arts and industrial uses, our report outlines how it can offer so much more as a branded, place-making center for Arlington. Unanimous in our support for the recommendations in our Committee report on an arts and industry quarter, we find that working in collaboration – business, arts and community – we have a strong opportunity ahead of us. The following Letter to the Editor was submitted by Edith Wilson, president of the Shirlington Civic Association and a member of the Four Mile Run Valley Working Group, regarding plans for Jennie Dean Park. 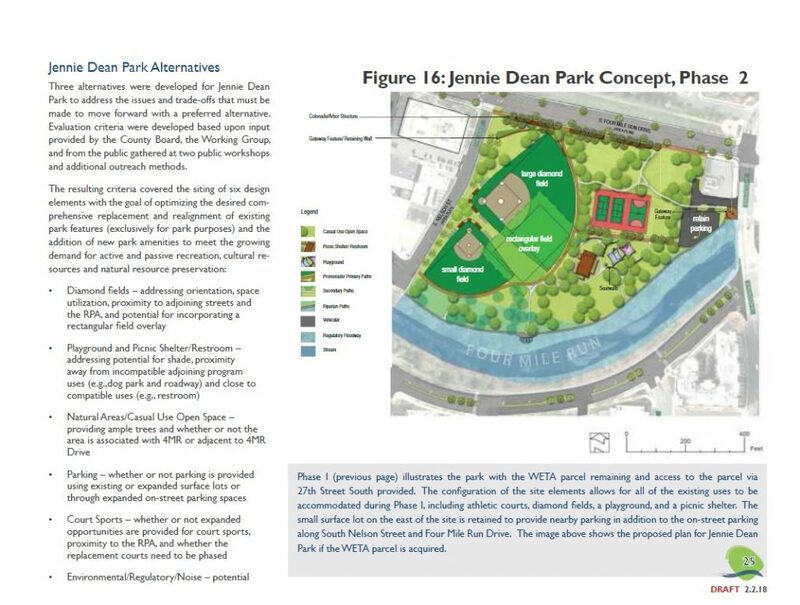 On February 6, the Parks & Recreation Department provided the Four Mile Run Valley (4MRV) Working Group with the staff policy framework for Jennie Dean Park over the next 20 years. Here’s a different view of the situation faced by decision-makers. This park concept is vastly improved over initial proposals, reflecting many compromises where there is no perfect solution, Markedly responsive to a wide range of sharply competing interests and community input, it does right by the environment by respecting the flood plain and resource conservation area (RPA) and planting many more trees. It increases total recreation facilities by creating a new rectangular field where soccer and other casual sports can be played. A brand new playground would be located in the center of the park amid greenery and away from noisy trucks and buses from County facilities and the cement plant. It leaves the majority of new parkland along S. Four Mile Run Drive for landscaping and open space. There is a lot of history to our valley, but part of that history is the new elements too. Take us for example. Over the last 40 years, residential multi-unit housing was built along the south side of the stream from the Village westward to S. Walter Reed Drive. 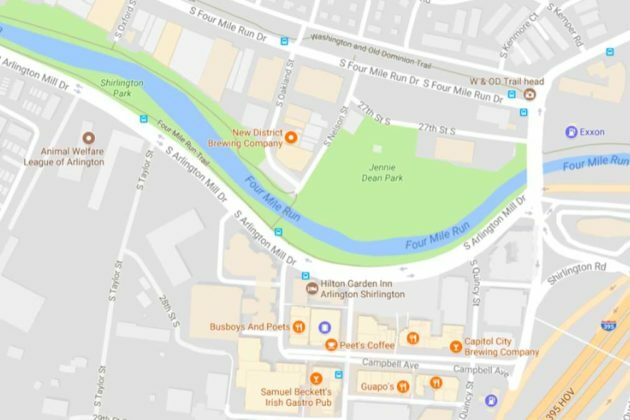 Twenty years ago Arlington County worked hard to create the Village of Shirlington, a landmark mixed-use urban village with a population that celebrates its diversity. The Shirlington neighborhood now has over 2,200 households with tens of thousands of regular visitors to its business areas. How can this work, though, since there is no park, playground, not even a school or church with open space, in this area? What was the County thinking? 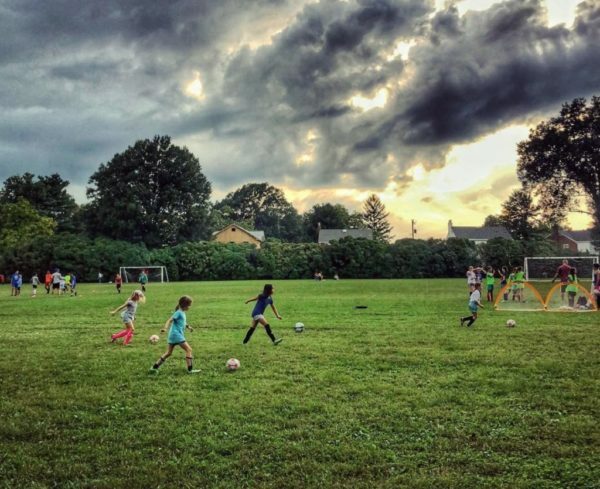 The answer is that literally across the street, though not within the boundaries of the Shirlington neighborhood, are the parks our community depends on: the long landscaped strip along S. Arlington Mill Drive, the dog park, and Jennie Dean Park. Arlington residents from all over come here with their families and pets. 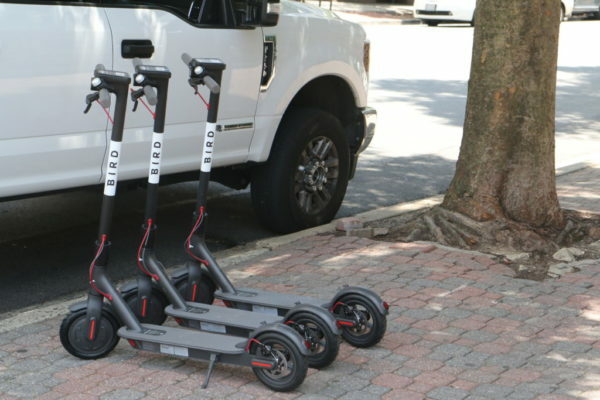 Shirlington residents are out there every single day, often several times. What makes the valley between Shirlington and Nauck special is our beautiful section of Four Mile Run stream. This is presided over by Marvin, the elegant Great Blue heron who lives on a small rocky island in the lower stream, a stretch few visit because it is blocked by a large softball field fence. The Great Blue heron is the largest of all the North America herons, If you are lucky, you can see Marvin gliding down the center of the stream at dusk, dipping like a trick pilot under the pedestrian bridge. There are raccoons, turtles, ducks, geese, snakes, fish and lots of other birds too. Providing public access to the stream and wildlife such as this was the guiding principle of the enormously successful 20-year-old stream restoration project from Shirlington Road eastward to the Potomac River. Now it’s time to extend that principle westward. This area has a high risk of flooding. – why do you think WETA needs to leave its old production center in the middle of the park? Environmental rules and common sense mandate addressing these conditions but the current softball field location stands in the way. The proposal shifts this field away from the stream, leaving a large open space for many more water-absorbing trees, traditional picnic areas, a nature overlook and a riparian pathway. Moving this field, in turn, also creates space for a new rectangular playing field lying across the back of two slightly repositioned diamond fields. Again, two-thirds of the frontage along Four Mile Run Drive would still be turned into casual space with landscaping and room for an impressive park entrance. As Arlington’s population and density increases, demand for park and recreation space is shooting up. No one neighborhood owns any of these parks, not even those of us close by. Let’s absolutely respect and honor the important history of this particular neighborhood – including the baseball and softball leagues that have been played here for decades — but let’s focus on the future we need to build together. Let’s share. The following Letter to the Editor was submitted by long-time Nauck resident Portia Clark, the current president of the Nauck Civic Association. My family has lived in Arlington for more than a century. I was raised in Arlington, and my children and grandchildren live here too. Some of my ancestors from the 1800’s are buried in the cemetery next to Lomax A.M.E. Zion Church, which was established in 1866. Lomax falls within the Four Mile Run Valley Study Area. When I was young, I went to Arlington public schools. Yet, my mother growing up in Nauck, was not allowed to play in most Arlington County parks because of the color of her skin. 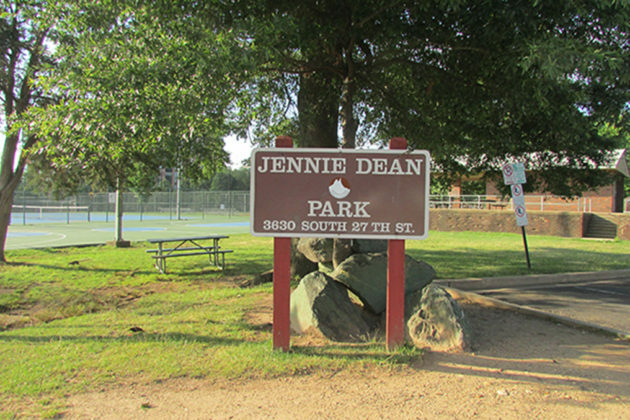 The the only park open to her and her siblings was Jennie Dean Park. 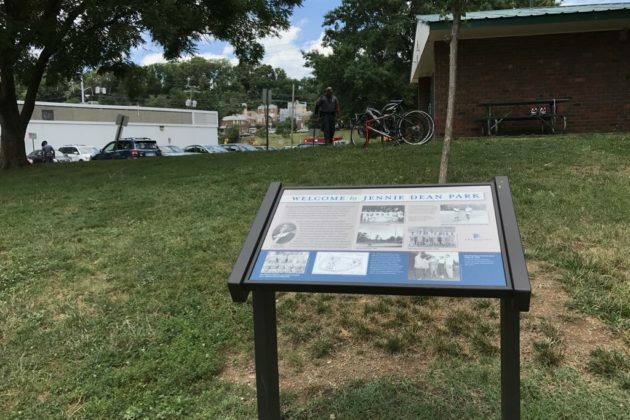 Arlington County’s then- Department of Recreation noted in its 1949 report that Jennie Dean Park was the county’s “sole recreation area for colored citizens.” In the Park’s historical markers, there are photos of my family members, friends and neighbors. 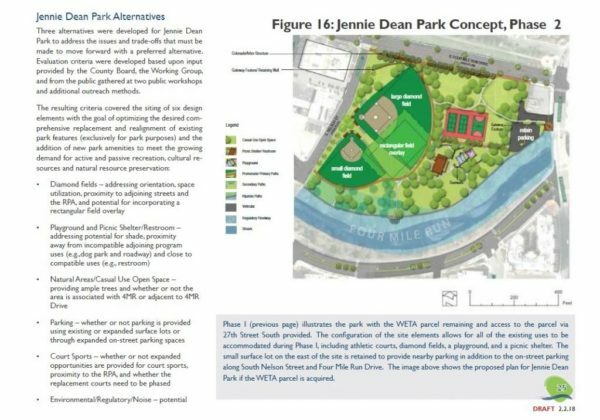 After decades of waiting, Arlington County is now focused on revitalizing Jennie Dean Park and the surrounding area in Nauck. I have seen the draft plans for Jennie Dean Park put forth by Arlington County staff. The plans are astoundingly tone-deaf. The Nauck community hasn’t asked for much with regard to Jennie Dean Park, other than to revitalize it and to minimize the impacts on our community. We certainly have ideas for what amenities we would like to see in the Park, but we understand – maybe better than anyone else – that parks should be for the entire community. So, when the County told us that they wanted the same amenities to stay in the park – no more, no less – we understood that everything we discussed at numerous meetings could not go into the park. We did insist, however, that respect be paid to the Nauck community. This means that the front of Jennie Dean Park, the portion fronting the neighborhood at Four Mile Run Drive, be left open for casual use. We want this area to be a gateway for the community to enter the Park. We want it to be green. We want it to be landscaped. We want it to have flowers and trees and open space. Instead, the County has drafted plans to place a baseball field in that spot, instead of another part of the Park. A baseball field, especially one with fencing and stadium lights, is not welcoming. The County’s draft plan also hides a playground and shelter area away from the community it would serve. This County plan offers no connection to the neighborhood and its cultural heritage, except for a historical marker with some friendly faces on it. This plan will negatively impact our community in a number of ways. It doesn’t have to be this way. In fact, the County drew up plans, which it insisted were viable, that accepts the placement we requested and the honor we deserve. The Nauck Civic Association has already voted – unanimously – that this draft plan from the County on Jennie Dean Park is a non-starter. We hope others will join us in expressing this concern. The following Letter to the Editor was submitted by Douglas Park resident Dan Hauser. I wanted to thank Arlington Cinema and Drafthouse for a really lovely gesture. He was so excited! He was sitting on the edge of his seat, eating popcorn and drinking lemonade, and giggling all throughout the movie. When the movie ended and the credits started to roll, Pete, the manager, asked my son if he might like something from Star Wars. He walked us across the stage and into a little office. He then gave my son a lightsaber and a bag that contained the original Star Wars trilogy on Blu-ray, a Star Wars puzzle, a Star Wars book, and four free movie tickets for the Drafthouse! My son was over the moon, and I was really touched. We’ve read the book twice and have had some epic lightsaber battles. My family loves going to see movies at ACDH. In fact, this was the second time I’d seen the Last Jedi here. 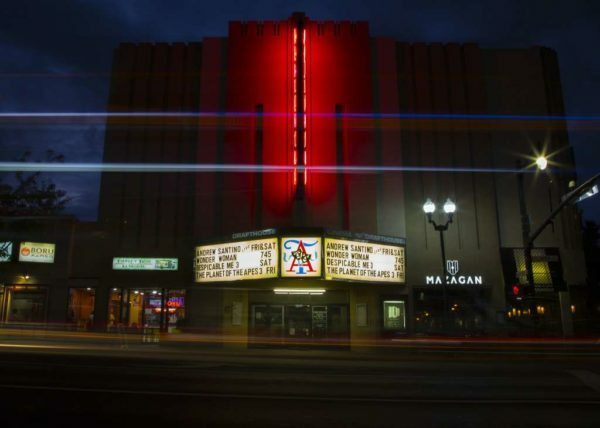 The Drafthouse was a huge draw for us when we were looking for a neighborhood to buy a house. We’ve had so many nice memories laughing, having snacks, drinking some beers (well, my wife and me), and watching movies. The Drafthouse is a verifiable Columbia Pike institution. Maybe one day my son will take his children here.